You've heard so many stories about custom built frames. A common practice for people who basically knows what they're looking after from a bicycle, the process is basically like getting yourself a tailor-made suit: done correctly, it will be a one-of-a-kind creation that will perfectly fulfill all your needs, be it mainly looks or just plain function. The story behind this custom-built steel off-roading machine is quite like that. Grown tired of how fast mountain bikes have evolved throughout the years, I wanted to have a mountain bike to cater my own specific needs. 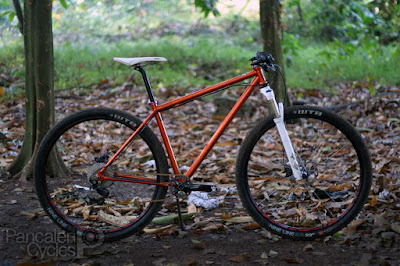 I'm not a hucker, so short-travel hardtail will do the job nicely. With less moving parts, a hardtail design also means that the bicycle can be kept as long as possible, able to accomodate technology updates during the following years, providing certain future-proof standards are used. 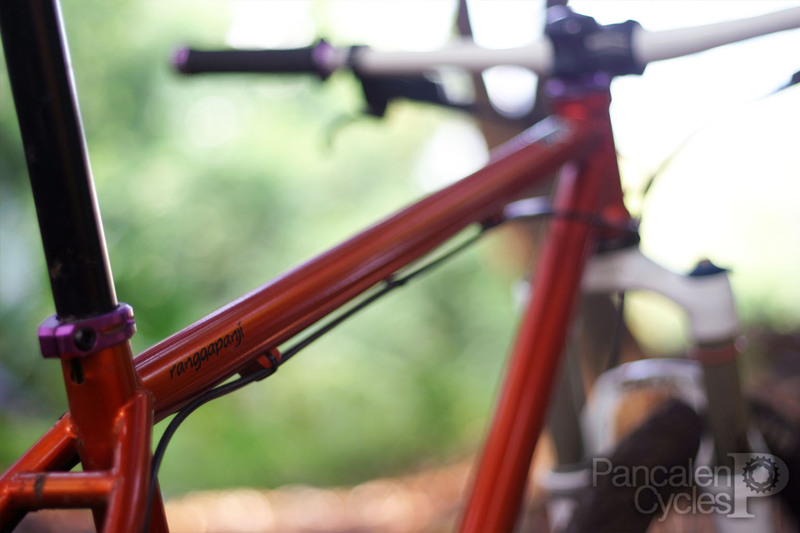 Steel is chosen as material because of its durability and lovely riding characteristics. Given these criteria, at the beginning I've searched high and low for a steel frame that will suit the needs well: 44mm headtube to fit tapered steerer, short chainstays for lively handling, also 142 x 12mm thru-axle rear dropout for extra rearend stiffness and future-proofing in wheel/hub choice. I fell in love with 29ers at the first time I ever slung my legs over one, so this bike will be wagon-wheeled. It has to be light enough to compromise my subpar athleticism. And then there's the silver bullet: the price. With every frame option available in Indonesia at that time, I came out with absolutely nothing. Welp, if we liked things easy, there will be no Pancalen Cycles, or Pias Cycles for that matter. Then I stumbled upon Babah Bikes. A one-man-army framebuilding company from Malang, East Java, Babah Bikes already turned few heads with handmade BMX, slopestyle, and freeride/downhill rigs such as Freddy and Jason and Brandal Locojoy, all the way around the globe. Joko "Jho" Prayitno, the framebuilder offers frames made with custom geometry as well, with materials ranging from hi-tensile steel, Taiwanese 4130 chromoly, and interestingly, Reynolds 500 and 520. All built within price range that won't break your bank. As what my parents said, if you can't afford one, then make do with one that you have, or went all the lengths to make one. Measurements were made, a couple sketches were drawn in our shop, some emails thrown back and forth, then it's a deal: I'll be having a custom 29er hardtail built to my spec. The frame was made from Reynolds 520 double-butted tubing, the lightest available in Jho's stock. The 44mm headtube was custom-turned because Jho didn't have one in stock—later he even provide builds with tapered 44/56mm headtubes, so this build was a kind of a learning curve for both of us. I only provide him my measurements and angles, and let him do on the rest—hence the BMX-inspired seat cluster. The simple, laser-cut thru-axle dropouts mounts like a pair of 150 x 12mm does (without 3,5mm tabs on each sides), but this was not a big deal, other than the extra washers we have to braze to provide better surface contact for the rear wheel axle. Before he started welding, Jho noted me that the frame will weigh around two and a half kilograms, but when the frame arrived and was put on a scale, the dial reads 2.010 grams. It's all good. We started with classic cross-country geometry. Medium height bottom bracket shell and steep angles chased with short chainstays, in 430mm. Although you can almost see the rear tire scraping the seattube, actually there is ample space for front derailleur—Jho kindly put a cable stop on the top portion of the seattube, the one that I ended up chopping because I like the look and simplicity of single-chainring drivetrain. If you spot the long-ish toptube and thought that the design was influenced by modern mountain bikes with long, roomy cockpit, you might be right. By moving the headtube slightly forward you'll have a bike that's stable on descends because of the increased wheelbase, yet retains its snappy handling because the headtube angle and chainstay length remains the same. But the actual reason is because I simply don't want to spend much on parts, purposing whatever that's lying around in our shop—that includes the crankset that the previous owner ditched because he ground off the 64mm chainring mount, pedals that was generously donated by a friend, mismatched tapered headset cups, and saddle taken from my late Masi Partenza. My fitting measurements demands 100mm stem, and because all that's available was a 75mm Specialized stem with multiple angle adjustment... at the risk of sounding lazy, I simply stretch the toptube. Done. The adjustable stem allows it to be set in positive or negative 8 or 16 degrees. On this build, this freebie stem that was taken from a small-sized Tarmac is a blessing. Even with the stubby headtube, I ended up slamming it down to get the desired handlebar position. 730mm flat downhill bar—another leftover from Andira's 29er—provides nice enough backsweep when rolled backwards a bit. Riding with only one chainring means I can ditch the left shifter, front derailleur, and two other rings to shed more weight. This setup also simplifies the bottom bracket area, providing less spots for mud and dirt to cling onto. 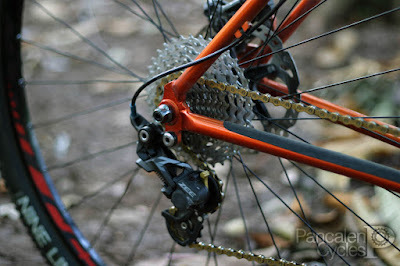 Minimizing the risk of chain derailment, I resorted to Race Face's brilliant narrow-wide chainring and Shimano Zee rear derailleur with Shadow Plus clutch system. Basically the clutch limits the movement of the derailleur cage, preventing chain slap and maintaining chain tension, further keeping the chain in place. The wheels are built from 23mm wide tubeless-ready Roval Traverse rims—another Specialized leftover from a customer's upgrade—laced to Shimano XT thru-axle hubs with Richman double-butted spokes. Spot the mismatched spoke colour between the front and rear wheels? Yup. Budget reason. Because I liked Fitra's Troll and Imam's mixte so much, I decided to mix their colour scheme on this build. The fact that Rockshox Reba RLT also came in white makes things easier, as it is on the trails: tweak it right and you'll have a lightweight fork that happily eats square-edged bumps—for a 100mm travel fork—yet provides stable pedaling platform when the trails pointed skyward. By the time I took this bike for a first spin, people mistaken it for a Federal—one defunct Indonesian brand that was very popular back in the nineties for their steel mountain bikes. To think of it, the brand didn't even survived to see the rise of 29er mountain bikes back in the mid-2000s. As a nod to this, I decided to spice this bike a bit with many purple anodized bits, a throwback to Federal's golden era. The name? Oh yes, glad you asked. Since Jho and I are both Javanese by origin, so it's very logical to name this one-off concoction as "Songolikur"—Javanese for twenty nine.